Have you ever noticed how often the best ideas are also the simplest? International Book Giving Day on February 14 is simple AND effective. I want to tell you about it now to give you several weeks to prepare and discuss it with your kids. Wrap up a box of children’s books that your kids have outgrown and get them into the hands of children who could really use a book or two. 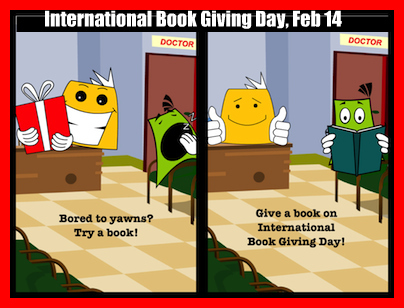 Donate your books to your local second hand store, library, children’s hospital, or shelter. Alternatively, donate your books to an organization working internationally to get books in the hands of kids, such as Books for Africa. So simple, but so incredibly worthwhile! What I love about this concept is that it's achievable with very little effort other than taking the time to think of others. Kids have the opportunity not only to receive a book from parents and friends, but to share the love of reading by giving a book to someone else. I think it would be a great idea to brainstorm suitable books and deserving recipients with children. I can imagine the looks of glee on young faces as they plot to smuggle books into waiting rooms that need them! And I love the idea of joining in as a family or class by recording the book gift so that kids across the world can feel part of a celebration that makes a difference. What will The Book Chook do? I'm in the truly fortunate position of always having too many books. Because I love my scarcely used booky friends, I want them to give pleasure to as many kids as possible. I have previously spoken to the lovely librarians at my local public library, who made me a promise: if there are any books they don't want, they will tell me rather than put them on the For Sale trolley. I then toddle off to local schools with them. Since librarians are my heroes, I have a very nice time donating books and chatting about children's literature! Gifting books to those we love is a very special way to show we care. Giving books to other kids is a fantastic way to involve your own family in a random act of kindness. Recycling books we've enjoyed just makes sheer good sense. 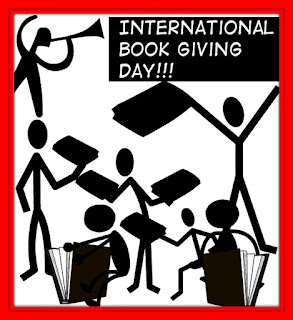 Book Chook Challenge: Take a photo of you/your kids giving a book on International Book Giving Day and send it to the IBGD website's special page. Give, leave or donate - what will YOU do? 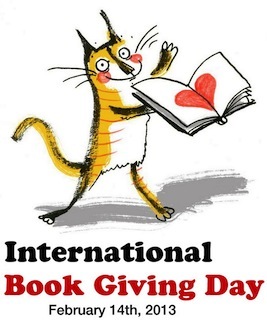 If you'd like to read more about International Book Giving Day, check out: International Book Giving Day: Spread Your Love, Support the Cause, 125 Literacy/Book Charities. Great post Susan, and love your graphics! @Playing by the bookThanks, Zoe. Apps to the rescue! It's so easy to make such a big difference. As book bloggers, we have the opportunity to pass on all the lovely books that are gifted to us. I'm really looking forward to sharing my books and plan to go through my kids' shelves as well. I hope to distribute to a number of different places including the school library, our closest city public library branch, our day care centre, our dentist's office, our doctor's office, and more. I'm going to sit down with my kids and plan this all out! @Renee C.I particularly love the idea of involving the kids - there's so much they can learn from discussions like that! Last year, our teacher librarian organised a school-wide book swap. It worked brilliantly. Children could bring at least 3 books (in good condition) from their houses. The numbers they brought is the number they were able to swap (up to 5, I think). The organisational logistics were heavy, but the kids loved it. In future reading conferences, many of my students said they got their current reading books from the book swap. @Janet AbercrombieIt sounds like an excellent plan! Thanks for sharing it with us, Janet. Here in Brasil it's summer vacation, so schools are closed. I'd love to get teachers, librarians, students to participate more. I'm so in love with this great idea: giving books away!So simple, so awesome! @Gisele Federizzi Barcellos It truly is a wonderfully simple idea, yet so beneficial too. Love your enthusiasm, Gisele! @Rosalie Skinner True! and so much better for my hips!